In a traditional setting, instructors use various tools to display information to you in class. They may use a smartboard to display a presentation, an overhead projector with transparencies, or a chalkboard or whiteboard that they write on. What would happen if you and the instructor were in separate locations? How might you exchange information and communicate? Your instructor might use Blackboard’s Collaborate software. Like Wimba Classroom, Collaborate is a powerful communication and collaboration tool that allows real-time online instruction and discussion with your instructor and classmates. With Collaborate, you can engage in two-way audio conversations with your instructors and peers, take part in real-time problem solving activities using the interactive whiteboard, share your applications and desktop, participate in breakout rooms and group specific activities, and take advantage of session recordings to replay lectures for greater understanding. The Collaborate tool is a fun way to connect in real-time with your instructor and fellow students. Before joining a Collaborate session, follow the checklist below to make sure that your computer is set up properly. Ensure your computer meets the minimum system requirements recommended for running a Collaborate session on your computer. Review the Getting Started materials for more information. We recommend that you also run a first time user check. Make sure you are using a Collaborate supported browser (our recommendation is either Mozilla Firefox or Safari). Launch into a private Collaborate session where you can familiarize yourself with the interface and features or review presentations prior to joining your scheduled session. Once you have successfully launched into a Blackboard Collaborate Web Conferencing session, run the Audio Setup Wizard to ensure your system is functioning properly. Java is required to use Blackboard Collaborate. Visit our Java support page for information about troubleshooting Java. DO NOT USE YOUR COMPUTER’S BUILT-IN SPEAKERS or any external speakers if you are required to participate in a Collaborate session with your microphone. Doing so will cause your microphone to pick up the sound from your speakers and the resulting feed back will disrupt the session. 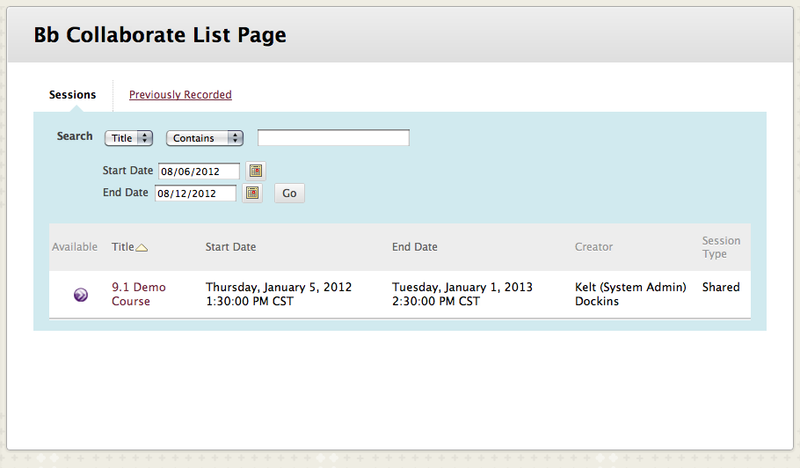 You can only access the Collaborate tool from within content areas inside a course. 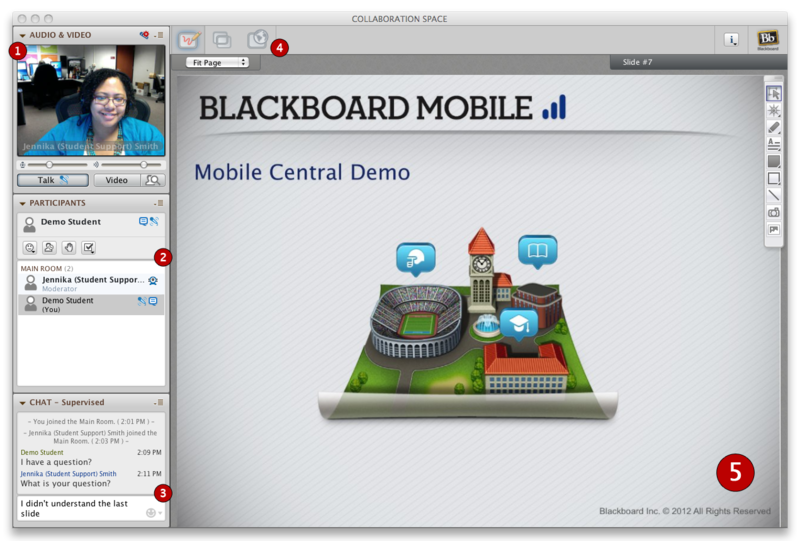 Click on the link with the Blackboard Collaborate icon (i.e. Learning Modules, Content Folders, etc.) to access the Collaborate session. You will need to download the Collaborate Launcher the first time you access the session (Learn More). Your instructor may identify Blackboard Collaborate rooms with a name unique to the course or the content areas they are located within. You can identify Blackboard Collaborate rooms by the icon that appears next to their titles. 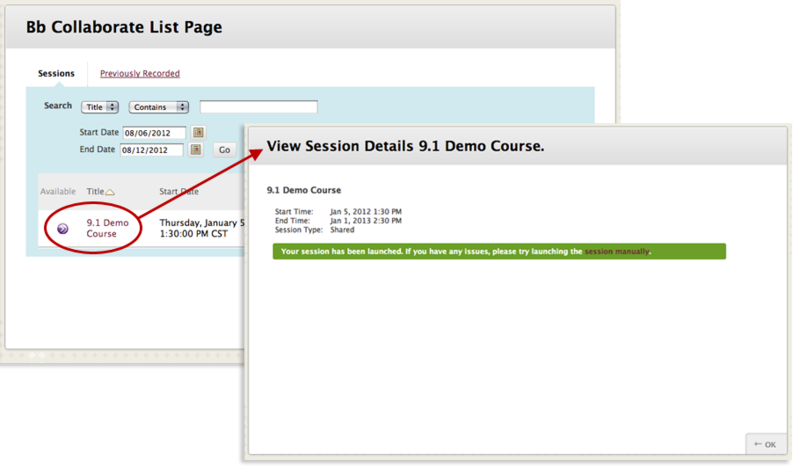 You can identify Blackboard Collaborate courses by their content icons (shown above). Once the Collaborate session is launched, it will appear in a new window. The Blackboard Collaborate Web Conferencing room consists of six main components. Audio & Video Panel Enables you to participate in conversations either using a microphone and speakers (or headset) or via a teleconference. You also can transmit and receive video during the session and preview your video before transmitting it. Participants Panel Provides a list of all Participants and Moderators in the session and information about their current activities, such as talking (Audio), transmitting Video, sending a Chat message, using the Whiteboard drawing tools and conducting an Application Sharing session. Above the Participants list is a small toolbar containing buttons for raising your hand and stepping away from the session and menus for selecting polling responses and feedback options. Chat Panel Enables you to send Chat messages to everyone in the room or to moderators only. By selecting names in the Participants list, you can send private Chat messages to individuals. Messages can be printed and saved to track session communication. Collaboration Toolbar Contains three buttons for switching between the three content modes (Whiteboard, Application Sharing and Web Tour), an Information menu for obtaining session information (e.g., connection type) and starting the Timer, a Load Content button for loading content into the session and the Record button. Content Area The main presentation window. Moderators use this region to load presentations. Everyone can use the tools on the Whiteboard to draw or write. All the objects and images on the Whiteboard are dynamic and can be modified. Everyone can print the Whiteboard pages or save them to a file to review later (unless the Whiteboard has been protected). For more information about the individual features of Blackboard Collaborate, please review the Blackboard Collaborate: Essentials for Participants Guide. Visit the Collaborate Support portal for troubleshooting assistance after hours.